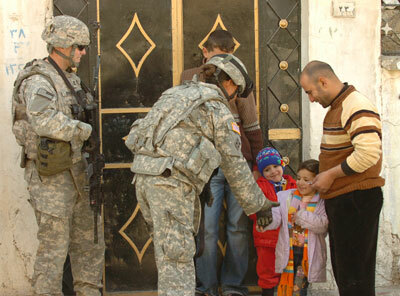 U.S. soldiers distribute candy that was collected from an SHSU College of Business Administration toys and candy drive to Iraqi children. COBA also held a drive to collect personal items for soldiers that returned from overseas in January. The son of a Sam Houston State University professor recently helped recognize the College of Business Administration for its service to the troops. Sgt. Jeremy Zelbst, son of assistant professor of management Pamela Zelbst, presented a certificate of appreciation to COBA from Lightning Troop, Thunder Squadron and the Third Armored Cavalry Regiment on May 30 at the Smith-Hutson Building for two drives the college faculty, staff and students held in support of the U.S. Army soldiers serving in Mosul, Iraq. The first drive was to collect toys and candy that the soldiers could distribute to the children. Zelbst said the idea came from retired faculty member Victor Sower, who wanted to show support for her sons, both of whom were serving in Iraq. The shipping costs were funded by management professor Kathy Utecht. The second drive was held to collect items such as shampoo and toothbrushes that 53 single soldiers would need when they returned in January 2009. “Most of the 53 returning single soldiers had no family in Texas,” Zelbst said. “That meant when those soldiers got off the plane they would not have the things they needed to shower and just relax. “As a result of this drive we were able to give each returning soldier a bag with toiletries, snacks, T-shirts, flip-flops and lounging pants,” she said. In addition, some local businesses donated items. “There were so many involved it is impossible to name them all,” Zelbst said. “Parents outside of the immediate area collected funds for gift certificates to fast food restaurants and movies. “When the contents of a bag the single soldiers received was calculated, it was worth almost $60,” she said. Because of the work they have done on behalf of the troops, Zelbst said she has been contacted by other units currently stationed in Iraq asking for other items. They are hoping to host a drive to collect items such as baby wipes and bar soap for a Washington state-area unit. Twenty local children will help share the Norwegian folk tale “East of the Sun and West of the Moon” as part of the 2009 Children’s Theatre Festival Tuesday through Thursday (June 16-18). Supported by the SHSU Department of Theatre and Dance and the Huntsville Arts Commissions, the production will be presented at 7 p.m. each evening on the University Theatre Center’s Mainstage. In the festival adaptation of the tale, Tove is sent away by her mean-spirited mother to live with the trolls. There, Tove falls in love with a prince who has been transformed into a bear by a troll and then follows him to the land east of the sun and west of the moon to save him from a troll marriage. “East of the Sun and West of the Moon” stars Anna Kareva as Tove, Viktoria Kareva as her mother and Jacy Anthis as the prince. The cast also includes Callie Cooling, Dustin Cooling, Alyx Cousins, Keanu Cousins, Sean James, Madison Lively, Thomas Matchett, Chris Morris, Hailee Roddy, Ethan Nash, Tucker Nash, Alex Norman, Elliott Norman, Payson Norman, Ashley Thomas, Christina Wood and Daniel Woodlief. SHSU alumnae Karen Roberts and Kara Coffey serve as the director and stage manager, respectively, and designers include theatre staff member Craig Brossman (technical director and set) and SHSU alumnus Charles Page (lights). Tickets are $5 for adults and $2 for children and may be purchased from cast members or from the UTC Box Office each evening of the performances, beginning at 6 p.m. Parking is available behind the Newton Gresham Library. Sam Houston State University’s work with two-year universities has earned a 2009 STEP Award. SHSU was one of two universities to be presented the “silver” Successful Transfer Enhancement Program award in the category of “Best Practices in External Collaboration” during the Texas Higher Education Coordinating Board Transfer Success Conference held in Houston. Eighteen colleges and universities were competing in the two-to-four year collaboration category, with two universities winning “gold,” “silver” and “bronze” awards, according to Keri Rogers, assistant vice president for Academic Affairs. The state-level awards recognize outstanding work in serving transfer students within the state of Texas, according to the institute’s Web site. “It really is a pretty big deal in the world of transfers,” Rogers said. Over the years, SHSU has developed a number of programs designed to facilitate cooperation between the university and both community colleges and the public school districts served by community colleges, according to Rogers. These programs include online articulation, joint admission, reverse transfer, cooperative advising, transfer orientation and services, transfer scholarships, guaranteed financial programs for students receiving federal aid through the Bearkat Promise program, and a speaker series. “Sam Houston State University’s goal has been to develop a comprehensive program addressing all major transfer component areas including native and international students,” the entry form said. Golfers who pitch up an appetite while playing at the Raven Nest Golf Club can now dine with a view of the course with the opening of the University Hotel Café at Raven Nest. Open weekdays from 10 a.m. to 6 p.m. and weekends from 7 a.m. to 6 p.m., the café offers a menu of burgers, sandwiches, wraps, soups and salads ranging in price from around $5 to $7. On Thursday (June 11), the University Hotel Café will give the community a sample of what they will be serving during an open house from 11:30 a.m. to 1:30 p.m.
“We will have exciting menu options of food and beverages to give them an idea of what the food will taste like,” said AK Kahn, University Hotel general manager. Patrons will be able to sample some of the soups, burgers, sandwiches, salads and try finger food-sized portions of other items, Kahn said. The café is open to the public. A full menu, including prices, is available online at http://www.shsuhotel.org/. After taking a break during the spring semester due to equipment malfunction, the physics department is re-launching its planetarium series program to point out the summer constellations with two different programs beginning June 16. “Two Small Pieces of Glass,” a “journey through the history of modern astronomy from the perspective of two youths who learn about the different types of telescopes and who invented them,” will be held at 3 p.m. that day, followed by an exploration of the “most extreme planets ever discovered” at 7 p.m.
Another showing of “Two Small Pieces of Glass” will be held on June 22, also at 3 p.m.; and other showings of “Extreme Planets” will be held June 19, 22 and 26, all at 7 p.m. A number of July presentations are also scheduled. A new book by assistant professor of French Shirin Edwin analyzes the political, social and post-colonial interaction of Islam in a selection of West African Francophone novels. 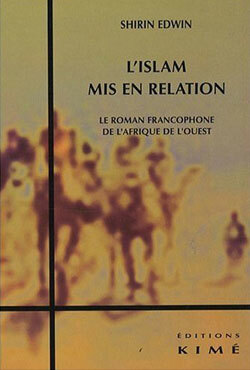 “L'islam mis en relation: Le roman francophone de l'Afrique de l'Ouest,” Edwin’s first book, which is written entirely in French, sets about to correct some of the “theoretical imbalances by not only presenting the syncretic aspects of Islam as it is practiced in West African societies but also its orthodox and strict versions where African Muslims do not always readily mix Islam with non-Islamic practices,” Edwin said. The 208-page book is divided into four chapters that analyze West African Islamic literature during the French colonial period, the period of independence from French colonial rule, the period of reconstruction and up to the current period, characterized by immigration and an increasing flow of the African Muslim Diaspora to Western Europe. Edwin said she chose the topic because there is almost an exclusive association of Islam with only the Middle East and its politics, as well as to show how Islam is an important marker of identity in West Africa. She said she also hopes to “avoid the earlier theoretical pitfalls of an improper interpretation of Islamic practice and concepts where scholars have not adequately studied the Qur'an or its supporting (exegetical) texts and have made numerous erroneous conclusions about Islamic practice and Muslims in general. “For instance, in chapter 3 devoted to Islamic feminism, I show that the perceived notion of widow seclusion in Islam is not an Islamic concept or Qur'anically sanctioned practice at all, though critics of the novel in analysis (Une si longue lettre) have been erroneously attributing the practice of widow seclusion in the novel to Islam,” she said. “L'islam mis en relation: Le roman francophone de l'Afrique de l'Ouest” is available on Amazon.com. With the different, and sometimes more challenging, atmosphere classes take on during the summer, the Student Advising and Mentoring Center is tailoring its study skills workshops to help students with the four-week sessions. The Study Skills Summer Workshop Series will begin Tuesday (June 9). The workshop series for the first summer session will be held through June 30. A second workshop series, which will cover the same topics, will be held for the second summer session and will begin July 13. For more information, or to register, call 936.294.4444.